Mannheim, 25 July 2017 – Deere & Company said today it has signed an agreement to cooperate with Väderstad to sell their products through the John Deere dealer channel in Russia and Ukraine. In the CIS John Deere is the leader in locally produced broad acre air seeding and tillage equipment. 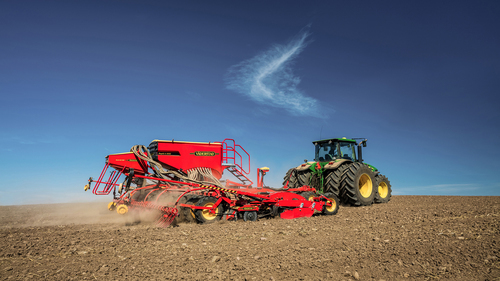 To further improve the attractiveness of the product portfolio, John Deere and Väderstad have agreed to provide combination air seeders as well as compact/high speed disk seeding and tillage implements through the John Deere dealer network. All products will be sold under the Väderstad trademark. This equipment in addition to our current John Deere machines represents an industry leading portfolio to arable customers focused on small grain and corn production. The partnership enables Väderstad to improve their access to the Russian and Ukrainian market. Both companies are going to cooperate regarding marketing, service, training and retail finance solutions by using the John Deere sales and marketing channel. “To further enhance the value for customers and dealers, John Deere and Väderstad will also start a technology collaboration, ensuring Väderstad equipment will flawlessly connect to John Deere tractors and MyJohnDeere.com, supporting an increasing trend to precision seeding & tillage applications?, said Aaron Wetzel, Vice President, Crop Care Platform. “This new partnership allows John Deere dealerships to provide a more complete portfolio of implements to Russian and Ukrainian customers”, said Christoph Wigger, Vice President Sales & Marketing Region 2.